Now we know there's only a few weeks left until Jett Rocket's finished form lands on WiiWare we're all the more eager to take it for another spin following our recent First Impressions preview. Understandably unable to speed up the passage of time, Shin'en Multimedia has instead sent over a new video of the title to help pass a few more minutes of waiting. 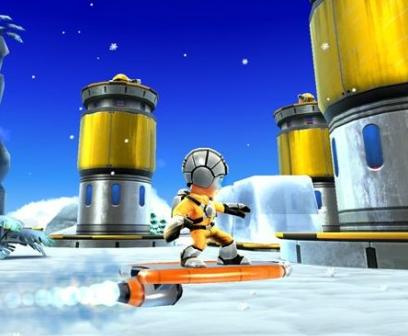 Set in the game's Northpole area the video shows off Jett's moves, including a hoverboard, ski lift and a homing attack that makes short work of enemy robots. There's also some slightly crazy music and a robot boss named Herzog, so truly something for everyone. Check out the trailer below and spend the next minute and a half watching a small chap with a rocket pack doing cool things: it's what the Internet was made for. Still looks good. Gameplay looks fine, imo. Wiiware needs more 3D platformers anyway. For WiiWare that is most excellent. I still cannot believe that this game is only 40 MB big. How on earth can they produce a game this awesome at such a small size. I'm just waiting for a catch. Maybe only a few levels or a very short length. But I'm eagerly awaiting more information and the release date. This is the first real 3D platformer for WiiWare and it looks really cool. I don't think there is a catch. Other great platfomers like Banjo Kazooie are only 16MB as far as I know. I think only the low price may prevent such WiiWare games from being very extensive. If it's as good as it looks, I hope it gets the same kind of reception that Lost Winds got, and that we get a sequel. More than a hint of Jak and Daxter/Ratchet and Clank about this. ^ And Sunshine, which is even less bad thing. I see this game as being short only because it'll be a lot of fun and you won't want to leave, if that ends up being true then we'll be getting a sequel.